Street life was the norm in London – the accommodation was too cramped for entertaining inside. Children played in the street from an early age, while the women of the street observed life from their front doors acting as unofficial censors of the morals and safety of their area. When they moved to St. Helier, the children carried on their way of playing but had the benefit of the new green spaces. Many women missed the bustle and friendship of London, but the pride in having a completely separate house (together with not wishing to put on show how poor the interior might be) meant they stayed formally friendly but rather distant from their neighbours. This page was added by Cheryl Bailey on 01/08/2010. My parents, my older brother and I were the first family to live in 72 Wendling Road. That would have been in 1932 when I was just 5 years old. We came from Balham where we used to live in a downstairs flat and another family lived about us. When I first went into our new home I didn't think that I was allowed up the stairs as I thought that somebody else was living up there! It seems that our part of the estate was the last part to be built. I remember my mother taking me to Winchcombe Rd school on enrolment day, the school having just been built. Well, there was chaos, with the school hall over run with mothers and children. A teacher had to stand on a chair to look over the crowd in order to direct the mothers where to go. Happy Days!! My Dad was first in the queue to get the keys to a prefab in our road - he left for a short time and when he got back he found he was third - this meant that we had a prefab in a bend of the road and had the largest garden. That was great as Dad loved gardening and he made a wonderful job of it with a big veg patch, a sunken lawn with a lilac in the middle and concrete steps around it. We backed onto the Green Wrythe Lane school canteen and one year there was a fire there and the lilac got singed and the windows got cracked in our living room. Loved that place -all fitted kitchen with a fridge etc. 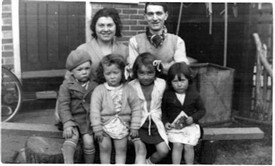 My mum and dad, Doris and George Stuart, had their first home in a prefab in Middleton Way. One of my earliest memories was waking up one Christmas Day, thick with snow, and a new doll on the end of the bed. I must have been round about two years old. We loved the prefab. All built in appliances. A lovely multi-fuel fire in the lounge which was at the back of the prefab, facing the back garden. We also had a proper bathroom - the only one we had until they swung over the new bathrooms in Titchfield Road in about 1969. I started school from that prefab. Across the road to the infants school at Green Wrythe. My very earliest memory was being pushed in my pram from our prefab down to the circle by my aunt and uncle who were both arguing who was going to push me in the pram. Happy days! Born in St. Helier Hospital towards the end of the war. My parents had moved to a flat in Winchcombe Road as the first tenants and I went to Winchcombe Road infants and juniors (directly opposite) We moved as a family to a two bed house further down Winchcombe Road and I joined Bishop Andrewes Church as a choirboy. Years later met my to be wife, and while organist and choirmaster there we married and moved to Carshalton. Val worked at St. Helier as a nursery nurse, later to be in charge on F6. Proud to have grown up on the estate and to have been very much part of the community. Just a few cars in the road in those days and well cared for privet hedges and front gardens. Gas lighting for many years too until the "new fangled" electric lights. So very many memories - perhaps will write a book one day! I think Mr Jones is in error when he says 1932. My family moved into the new house in Sherborne Crescent in 1934, I was ten. The gardens front & rear were full of heavy clay which I helped Father to clear. The 'Big Wood' opposite the 'Buttercup Field' became a source for firewood. I was born in a Bermondsey tenement so the wide open streets and fresh air was semi paradise. I retain fond memories of the estate, of the years I lived there until called to the Royal Navy for war service. My Grandparents were Henry(Harry) and Emily Hinder moved with My Mum Cissie, and her Brother Harry, and sisters Flossy and Lily to Cartmel Garden when mum was 12. This was either the end of 1929 or the beginning of 1930. There was no school for the first 6 months! My Grandad who lived until 1984 and stayed in the same house always said they were among the first key holders on the estate. My mum went on to live in Whitland road and then Wrythe Lane where she lived until her death in 2005.